What's the Deal With Micro Mini Pigs as Pets? Having a micro mini pig as a pet is sometimes an ordeal. And I would know! First, you have to decide how much squealing your eardrums can take! Micro mini pigs as pets? Meet Cocco. Having a micro mini pig as a pet is sometimes an ordeal. And I would know. First you have to decide how much squealing your eardrums can take. Then you need to decipher what the squealing is about. Is your pig being held? Is he hungry? Is he being cornered or feeling threatened? Or is he just… being… a mini pig? If you have never heard a mini pig squeal, there is nothing “mini” about it! It’s probably 10 octaves higher than you’d imagine. It is pretty painful to listen to, not only because the pig is so obviously unhappy but also because it does some serious damage to your ears. 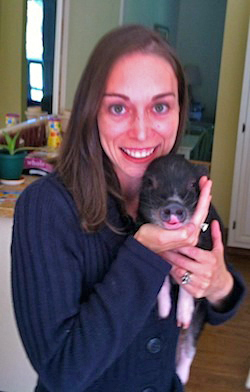 When we first got our mini pig, Cocco, we were expecting a teeny tiny bundle of cuddly love. We couldn’t have been more wrong! Not only did he not want to be picked up; he didn’t even want to be touched. Still, we would not give up on him, even when the breeder offered to take him back and send us a new, more docile and obedient pig. Mini pigs are usually even-tempered and adjust somewhat easily. Not so for our little Cocco, who didn’t fit the advertised easy-going reputation the breeder promised. That’s me, Katie, with Cocco. And so the torment — I mean training — began. Slowly, and with earplugs firmly in place, we showed Cocco that he was safe in our laps and up in our arms. The latter was quite the task, but he finally overcame his fear of being picked up and his squealing died down. It is instinctual for pigs to fight being picked up since the only time they are ever up in the air in the wild is when they are being prepared for dinner. They are prey animals, and their instincts kick in just before their squeal becomes a scream. And a scream it is. 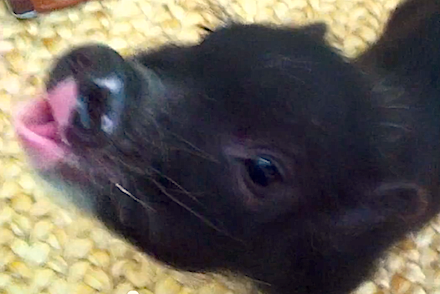 The worst thing you can do to a squealing pet pig is put him down mid-squeal. They are smart little (and big) creatures and are often considered the fourth-smartest animal, after monkeys, dolphins and whales. They use this intelligence against you. If you concede defeat to a squealing pig, that will only reinforce the squealing behavior. We learned this the hard way with Cocco. In the beginning, our kids just couldn’t take the screeching anymore, so we’d put him down when they begged us to just “make the pig stop.” We realized we would have to continue our work after the kids were in bed, preferably as far from their rooms as possible. After a week of unrelenting love and determination, Cocco finally accepted us and fell fast in love thereafter, impatiently waiting each night for alone time to cuddle after the kids were tucked in. Not all mini pigs require such strenuous conditioning to domesticated life, but most will require some sort of an adjustment period. Pig parents need to be patient and understanding. Even after the pig has made himself at home, the patience must continue as there is always something to learn when it comes to mini pig behavior. Now that Cocco has truly become the little bundle of love we envisioned, we could not imagine life without our little guy happily snorting all day long. He keeps us on our toes and definitely provides enough entertainment to keep my blog full of the adventures we experience daily with our amusingly mischievous micro mini pig. This featured contribution was written by Katie, an animal-loving wife and mom of two who was crazy enough to add a micro mini pet pig to her very busy bunch — which includes rescued Italian cats. 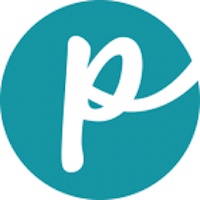 If you’d like to see more pictures and videos and read about what trouble Cocco has created this time, please Katie’s blog, myminipetpig.com.